Neutral colors allow for easy pairing with your choice of bedroom decor. Product Description First Class. Elevate your bedroom aesthetic with the dapper design of the Charlie Nightstand in White. This piece features modern detailing, including lucite bar hardware, recessed panel drawer fronts, and a glossy finish for sleek styling. Customer assembly required. 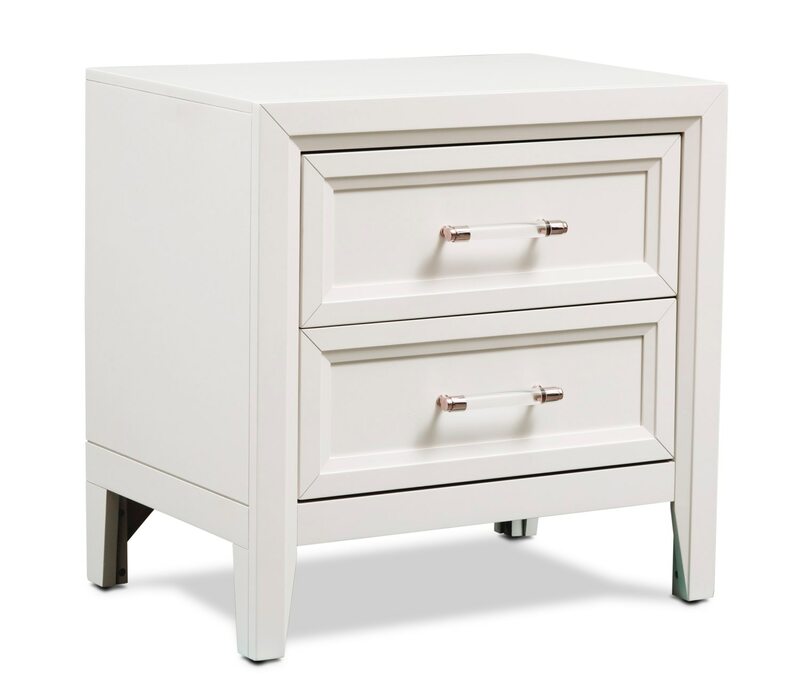 Unique Features: A glossy finish highlights the vibrant white color of the nightstand. Lucite bar handles and recessed panel drawer fronts add modern detailing. Deep set drawers offer ample space for bedtime essentials. Construction: Strong pine and poplar solids ensure durable construction. Drawers: Top drawer is felt-lined to protect valuables. Full-extension ball-bearing glides promote smooth drawer movement.